searching for all kinds of berries – blueberries, strawberries, raspberries, and blackberries. The story is based on rhymes and a play on silly words that delight the children, which makes this a favorite book amongst toddlers and preschoolers. The children will enjoy the adventures in the canoeberry, dancing in the meadows of strawberry jam, and riding the trainberry, clickety-clackberry down the trackberry. How did the pictures in the book make you feel? Did they make you happy? Were they silly? Tell me why. What types of berries were in the story? Can you name them? Is a berry a fruit or a vegetable? Is it a healthy or junk food? What is your favorite type of berry? Can you think of different ways to eat berries? Have you picked berries in a field? Tell us what you did. Challenge the children to make silly words ending with 'berry.' For example, each child can end their name with 'berry', like Johnberry, Tomberry, Julieberry, and Toniaberry. How about going to bedberry, bathberry, schoolberry, carberry, toyberry, and so on. You are sure to hear giggles with this game. This book is full of counting opportunities – "one berry, two berry, pick me a blueberry" and "three berry, four berry, hayberry, strawberry." If possible, bring in some fresh blueberries to count. Mark an egg carton from one to twelve in each section with a marker. Invite the children to place blueberries to match the number in each section cup. If blueberries are not in season, use manipulatives such as Legos to place in the sections. Practice patterns while making fruit kabobs for snack. Help the children thread berries (in season) onto plastic coffee stirrers or small straws. Use a simple ABA pattern such as strawberry, blueberry, strawberry, or advance to an AABAA pattern like raspberry, raspberry, blueberry, raspberry, raspberry. Collect those plastic pint berry baskets you get in the supermarket. Place tempera paint into containers. Invite the children to dip the basket into the paint and then print onto paper. Have several baskets along with a variety of primary (red, yellow, blue) paint colors. Note the square designs that are printed and the color mixing when two primary colors overlap to make secondary (orange, green, purple) colors. Invite the children to dance in the strawberry meadows like in the story. Make crepe paper wands for props that will blow in the wind as they dance. Take empty toilet paper cardboard tubes and tape or staple three lengths of crepe paper streamers on each tube. The children can decorate the tubes with markers or stickers if they wish. Put on some happy music and dance. 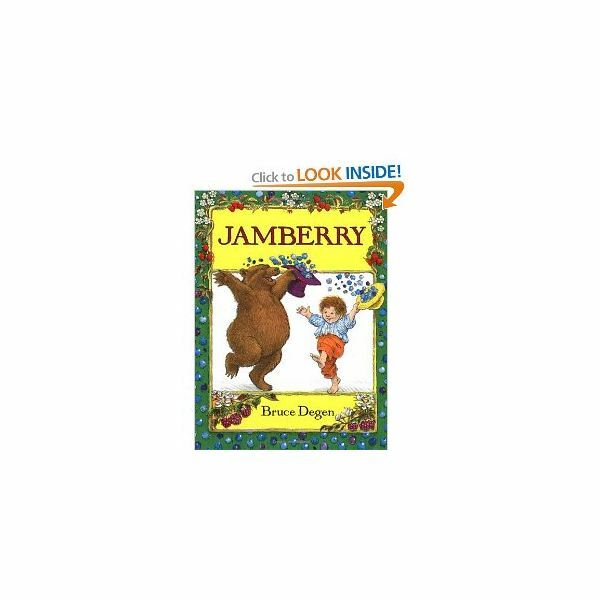 Bring in a variety of berry jams and invite the children to taste and enjoy them served on crackers or toast squares. Note: Always check with parents to make sure a child does not have an allergy to berries. Strawberry allergies are common. The main focus to this story is the introduction of berries as another wonderful fruit to pick and eat. Show pictures from the book and ask the child to name the berry. It could also be a lesson in colors as blueberries are dark blue, strawberries are red, raspberries are light red to pink, and blackberries are black. A variation in assessment would be to ask the child to draw the berry in question on a sheet of paper. These activities are meant to enhance the story and hopefully teach young children about berries and the joy of having fun with reading. Reading takes children on adventures in imagination; this book is one of them and may become a favorite in your class.